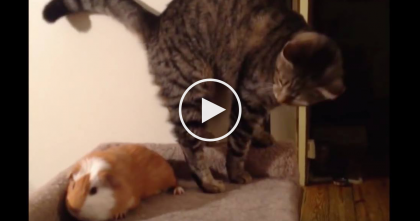 This sweet little kitty does the classic cat “bite and lick” to his favorite friend – the dog! 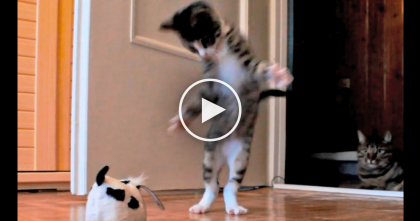 It’s so cute to see this energetic kitten and mellow dog play together. The doggie is very patient with the rambunctious little one, no matter what he does! The cat keeps biting and hugging the doggie’s ear, no matter what. These two are so cute! !—SHARE this video with you friends! 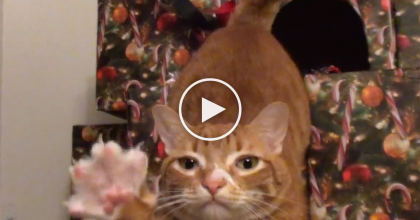 This Kitten Is A Basket Case, Goes Bonkers With Just About Everything… Oh, GOODNESS. 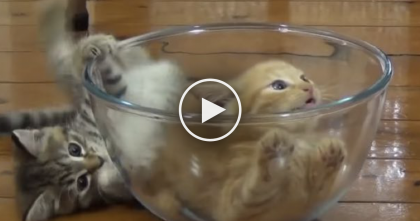 They Gave These Kittens A Glass Bowl, But You’ve Gotta See What Happens… Omg, SOO Cute! !